AMD launched the Radeon HD 8000M Series of mobile graphics processing units at CES in Las Vegas last night. These are the first GCN architecture GPUs available to notebook manufacturers. The company says that “designs are currently shipping with ASUS and Samsung, with Lenovo and additional OEMs shipping soon”. These high performance, app-accelerating GPUs are even suitable for ultrathins, according to AMD, due to their battery stretching AMD Enduro technology. At the same event AMD announced the availability of AMD HD 8000 series graphics cards for OEMs. These cards feature GCN architecture, support for Direct X 11.1 (for optimal acceleration in Windows 8), AMD app accelerations and intelligent power management with AMD ZeroCore Power technology. 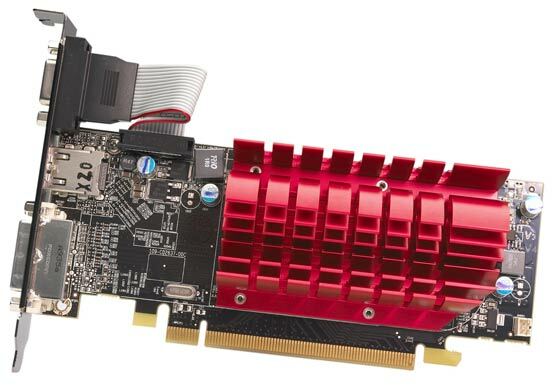 Radeon HD 8000 series graphics will be available in desktops from several major OEMs as soon as “late January”. However, these OEM graphics cards are mainly Radeon HD 7000 series cards rebadged to HD 8000 OEM cards to make them sound new and better. Even the lowly HD 5450 has been transmogrified into an HD 8350 OEM for the purposes of marketing. Matt Skynner, corporate vice president and general manager, AMD Graphics said of the launches “Today’s simultaneous launches of our AMD Radeon HD 8000M Series for mobile and the AMD Radeon HD 8000 Series for desktop graphics symbolize a major milestone for AMD – we are now bringing the capabilities of our GCN Architecture, and full DirectX 11.1 support to a much broader market.” He went on to say how these improved graphics processors can help users be more productive in multimedia applications and improve video and image quality whilst being power efficient. You can find the full specifications for the AMD Radeon HD 8000M series here in a PDF. so there is no point in upgrading from the HD 7000 series then lol, although the term “mainly” is that in reference to the 5450 or can we expect some brand new top end cards? Bit daft/misleading from the perspective of a consumer, but these are unlikely to reach retail sale under those names, although Oland could be interesting. The ‘real’ 8000 series Sea Island GPUs will be out later in the year. And to think I was all hyped up about this. When will amd stop this naming nonsense! So the top laptop part the 8870m is actually more like an underclocked 8760 (rebadged 7770) desktop part. Small problem is the 7770 is half a 7870. Looking at the old specs the new flagship is halfway between the 7850m and 7870m. I really don't see why they cant align the desktop and mobile parts. As Ryan Smith points out in the Anandtech article, this is actually largely driven by the big OEMs. They want new-sounding parts to put in their laptop/desktop refresh. I'm sure AMD would much rather they carried on using existing parts under the correct numbers, or waited to do their product refreshes when AMD had new parts ready, but given how suppressed the PC market has been recently, I'm not surprised that OEMs are desperate to get new-sounding products on the shelves. Apart from it's not the new flagship part. That'll sit two levels above the 8870m, according to the mobile roadmap. So there'll (presumably) be an 8900M range, replacing the 7800M, then something above that (goodness knows what!). It's exactly what they did with the 5000 - 6000 series transition on the desktop: repositioning the model numbers based on how they saw the market falling out. Apparently they've decided that the 7800M series were too good for mid-range mobile GPUs - they should've been the 7900M (although where that puts the 7900 I also don't know!). So the new equivalent series will be the 8900M, and everything else will shuffle down in performance and, presumably, price. So an 8800M will perform like, and cost the same as, a 7700M.